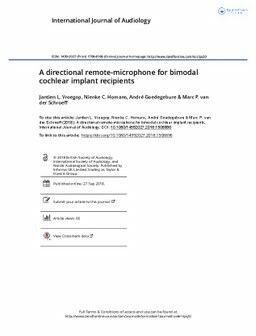 To evaluate whether speech recognition in noise differs according to whether a wireless remote microphone is connected to just the cochlear implant (CI) or to both the CI and to the hearing aid (HA) in bimodal CI users. The second aim was to evaluate the additional benefit of the directional microphone mode compared with the omnidirectional microphone mode of the wireless microphone. This prospective study measured Speech Recognition Thresholds (SRT) in babble noise in a ‘within-subjects repeated measures design’ for different listening conditions. Eighteen postlingually deafened adult bimodal CI users. No difference in speech recognition in noise in the bimodal listening condition was found between the wireless microphone connected to the CI only and to both the CI and the HA. An improvement of 4.1 dB was found for switching from the omnidirectional microphone mode to the directional mode in the CI only condition. The use of a wireless microphone improved speech recognition in noise for bimodal CI users. The use of the directional microphone mode led to a substantial additional improvement of speech perception in noise for situations with one target signal.